Absolutely perfect for a rainy morning. Even though it eventually stopped raining. I can’t give you the recipe because I was recipe testing for the second issue of Don’t Eat Off the Sidewalk, but I can share these photos. Must bake these… They look fantastic, Isa. i am now really looking forward to the second issue! Oh goodness… I can’t wait for the second issue to get the recipe for these. I can almost smell their awesomeness over the internets. These look and sound just delish!!!! Please let me know immediately when this book is available. I have to have the recipe to this. What a great blog! These look absolutely delicious. I have a weakness for anything with cinnamon in it…yum! Hi your comment is funny. I will definitely read your diary..
yum! 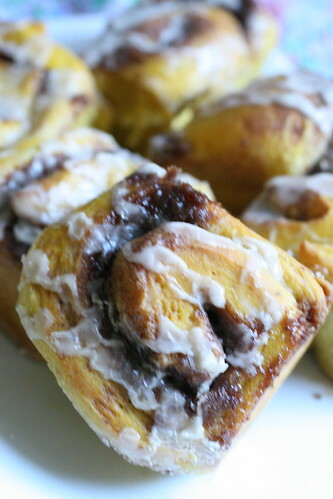 two of my favorite things…pumpkin and cinnamon rolls! ::drool:: Wow. Those look incredible! I don’t think I love anything more than pumpkin & cinnamon. To marry these two together in a gooey cinnamon roll… Heaven. What a tease! Just found your website, I’m hoping these gorgeous rolls will be perfect for the holidays. Pumpkin and cinnamon – yum! I have to try this. Hey, I never thought of cooking something like that. Thanks for sharing! Thanks for the book. I like cooking. I desperately want the recipe for this. I tried to make it myself using an old recipe I had but it didn’t really work out. Please share the recipe! hey… is that my cat Eileen O’Brien??? oh. never mind she’s here. after eating Guinness chocolate cake on the Aran Islands i came back and made it myself. so glad to hear there are others making the same wonderful things only better: VEGAN! wow! this is absolutely one healthy pumpkin cinnamon roll. 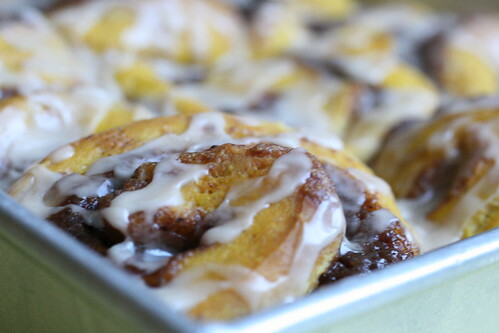 Your pumpkin cinnamon rolls looks fabulous! mouth watering. recipe needed. must have cinnamon rolls. argh. i really like cooking …. thank you for this book, .!! Oh my God does that every look good.. This will be on my table before too long.!!! I love it and I am going to try it. It sounds so fantastic and the picture is great.!!! These look mouth watering, I am drooling looking at the computer screne. I love breakfast pastries, I gotta try this, but maybe not with the pumpkin, what else would work good instead? Thanks! Well, that looks delicious. Would be perfect for Thanksgiving next weekend, along with pumpkin pie. They look great! I would love to try these, with or without the pumpkin! Its is great & delicious! I would like to eat some some rolls during Christmas! Thank you! Wow, how many of these things can you make with a decent size pumpkin? Like 1000 ? These really do look absolutely delicious. I simply love anything that has cinnamon. yum! I have been looking for a good cinnamon roll forever and I LOVE pumpkin! What do you think of substitutes for margarine…. coconut oil? applesauce? A bit of both, perhaps? Thanks! I am looking forward for your next issue. That is just what you need on a saturday morning. They look lovely. These look AMAZING. It is late in the night, but I feel like getting up and cooking now! Thanks for inspiring!!!!! Those look amazing! I will for sure have to make these! If you feel so inclined please check out my vegan blog! Just got your book out of the library and loved my first go at the Vanilla Cupcakes, I live in Australia, and was wondering if anyone knew of a suitable substitute for shortening? Just what the doctor ordered,the perfect recipe for a sunday family breakfast.Thanks so much for the recipe. My boyfriend and I love cinnamon rolls add the pumpkin on top of it and this is perfect for the fall season! Looks great!